Medium-dose aspirin reduces COX-1–dependent platelet aggregation. (A) Diagram of COX-1 and COX-2 products. Serum TXB2 represents COX-1 activity in platelets. 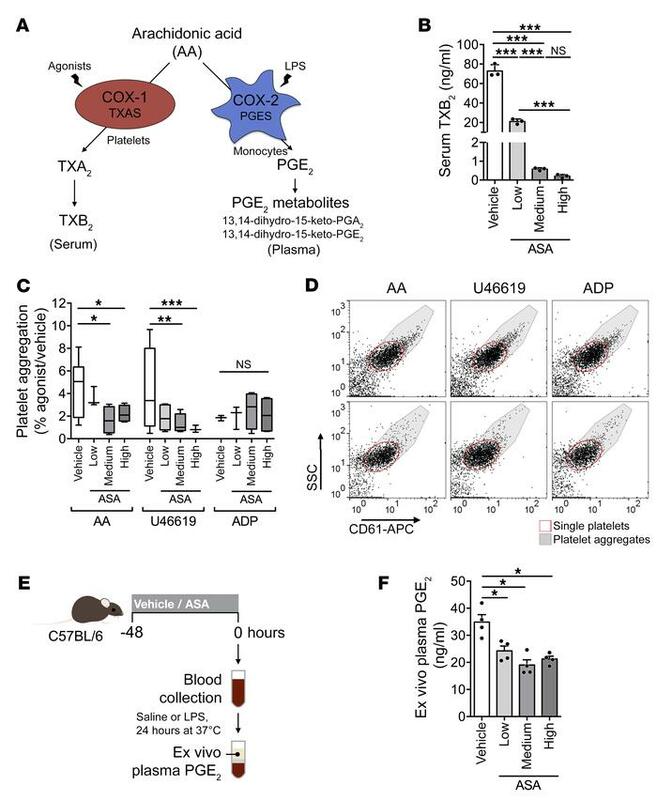 Plasma PGE2 represents COX-2 activity in monocytes. (B) TXB2 in serum from C57BL/6 mice treated with vehicle or aspirin (ASA; low, medium, or high) for 2 days before blood sampling (n = 3). (C and D) Agonist-induced aggregation of CD61-stained platelets from mice treated with vehicle or aspirin for 2 days. Arachidonic acid, U46619, and ADP were the agonists (n = 7 for vehicle group, 4 for all other groups). (E and F) Experimental design (E) and ex vivo PGE2 levels (F) in plasma from mice in B (n = 4). Data are represented as mean + SD (B and F), mean ± range (C). One-way ANOVA with Tukey’s multiple-comparisons test. *0.01 < P ≤ 0.05; **0.001 < P ≤ 0.01; ***P ≤ 0.001.